On June 14th, Colonel Grethe Cammermeyer joined Drew Emery and stars of the film for the Seattle Theatrical Premiere at the Cinerama. Cammermeyer shot to fame in 1994, after she challenged the US Military's anti-gay policy; a challenge which was immortalized in the movie Serving in Silence where Grethe was played by Glenn Close. 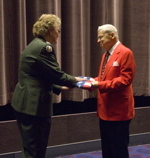 At the end of the show, Grethe presented Chuck Lazenby witha US flag in honor of his deceased partner, David Asplund. David proudly served his country during World War II, only to be denied a US Flag upon his death, as Chuck was not recognized as family. The flag was proudly obtained from Senator Patty Murray, and flew above the US Senate House on June 13th, 2006.